"...Speech Pathologists, you should never write a goal: 'Will answer Wh-Questions'..." Watch this video to listen to her brilliant explanation for this advice. I don't think that my work of sharing what I know about toys will ever equal the magnitude of reach of the Social Thinking program created by Michelle Garcia Winner. However, I will be quite content if I hear that at least one person who has read this review will take it upon himself to learn more about what I believe is the most cutting-edge program that can help so many children navigate the social world today. Why only one person? 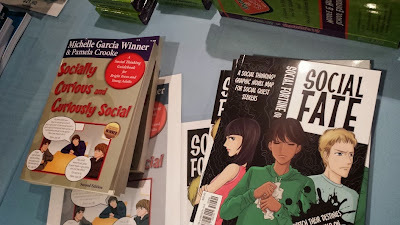 Truth be told, I want Social Thinking to spread like wildfire, not just because I like it for my own family but also because I think there are so many kids out there who are getting in trouble everyday for social gaffes when they really meant no harm at all. And it is not just social gaffes that are causing concern. Nope, Ms. Winner convinced me two years ago at a YAI conference that the challenges they face in being able to take another's perspective has deep impact on their academic life too. A lot of these kids exhibit high abilities in other areas like science and math and so their perspective-taking challenges are misunderstood or dismissed entirely. Thus, they never get the help they need. And that is a total shame. These kids need help too and that's why I'm writing this story today because I don't think there is any better help for them than Social Thinking. I first heard about Superflex and Social Thinking from the Quad Manhattan, an afterschool and now school-school for gifted kids with special needs. 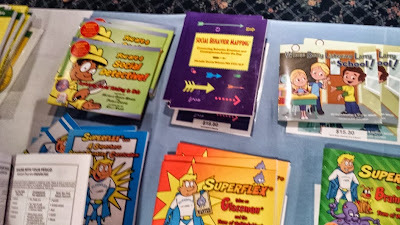 Superflex is a superhero who helps kids from being taken over by the Unthinkables who are representations of the social flaws that make a frequent appearance in my home. Rock Brain, Energy Hare-y, WasFunnyOnce, MeanJean, etc... it's all very funny and funny makes things stick to the brain (and heart). What kind of program can get OTs, SLPs, Special Ed and Gen Ed teachers, Principals, and Parents under one roof to learn something new to help kids? Social Thinking when learned and practiced correctly can be so helpful to everyone. Well, if I think I know the readers of this site, I would say that many of your kids are bright, verbal, probably even downright chatty, possibly know a lot about science, math, history... some of your kids are bookworms too. But a lot of your kids struggle in one or more of such areas like writing, reading, drawing, telling a story, and possibly even have trouble telling you what happened in gym class yesterday when they got in trouble. The Incredible Flexible You is a new curriculum for kids ages 4-7. Honestly though, after listening to the presentation on Day 3 by Nancy Tarshis and Ryan Hendrix, the program sounds so wonderful that I think all kids deserve to learn it. 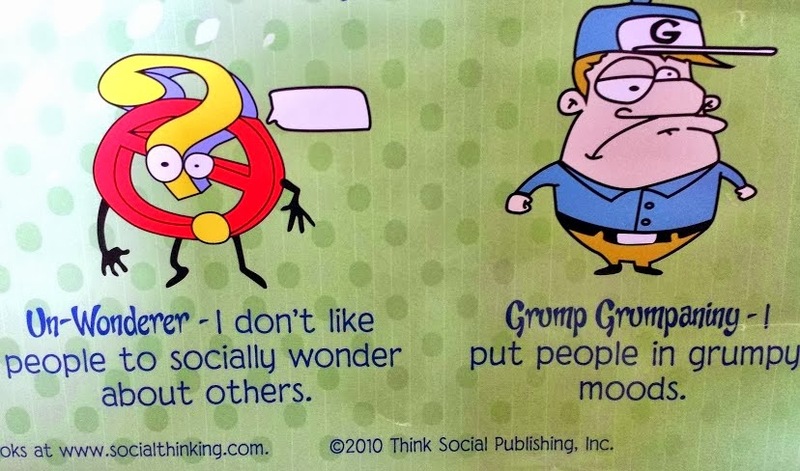 These cards are from a new GAME that they created for middle and high schoolers. 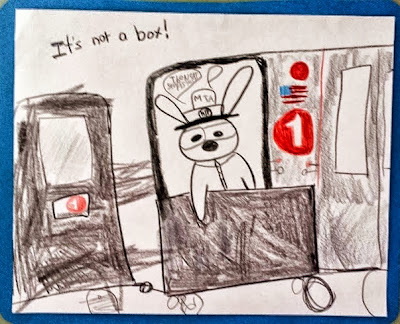 I heard that there will be one for younger kids too! I CANNOT WAIT!!!! I love these challenges! One of the reasons I love Social Thinking is that they are excellent at bringing humor when they teach. They also pay a lot of attention to the importance of executive functioning skills. 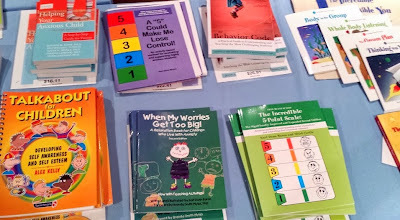 At the conference, Nancy Tarshis, informed everyone that Sesame Street is dedicating the whole year to teaching executive functioning. I was floored by the news but also busting out in laughter thanks to Cookie Monster. 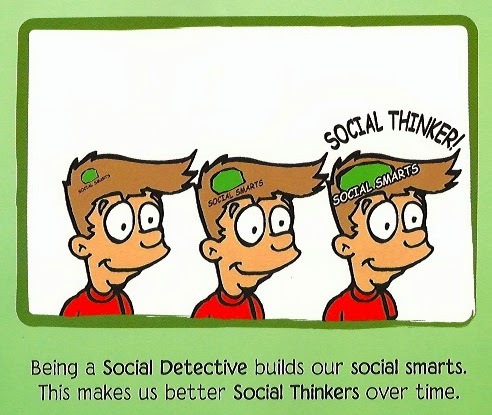 Social Thinking as I see it, is a very effective way to approach teaching children and adults to be more socially savvy. I think that people who are more well-versed in education and child psychology would be better at applying the principles to different types of children but for the purposes of this post, I can say that when I used my listening ears at the Social Thinking conference, I was always thinking of my #1 and #2 (and my husband too... shhh). These are two kids who for the most part look and talk as if they are savvy about all the social expectations out there but sometimes they really just don't know. Does this make sense? Maybe it sounds foreign but Michelle Garcia Winner masterfully breaks this down for you in her books and at the conferences. But here is my feeble attempt to explain the steps on this bookmark. 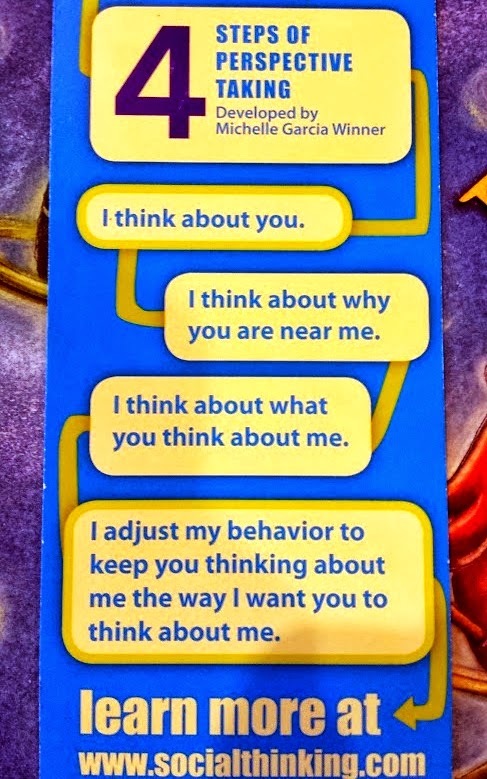 I love how they always come back to "HOW HE FEELS" That is what I love about Social Thinking. It's so very real. I love books focusing on teens. I used to teach job readiness skills to teens and so everything she says makes triple sense to me. I saw so many typically developing kids lacking social tact and executive functioning skills like setting your own alarm clock to wake up at an appropriate time or even calling to say you will not show up for work. In our test driven society, we forget the basics. And you think it won't happen but I used to teach in Korea too, another test driven society. My students would offer me a glass of water in a dirty cup because they didn't know how to wash the dishes. These were A+ students but if they took a dishwashing test, I would have given them an F for Food-Borne Illness. I never thought I would have this chance but I really did get to interview Michelle Garcia Winner! Of course, being me, I asked her how I could shop for a game that could work on perspective taking skills. For this she gave me a wonderful example of a game that you can play for free! 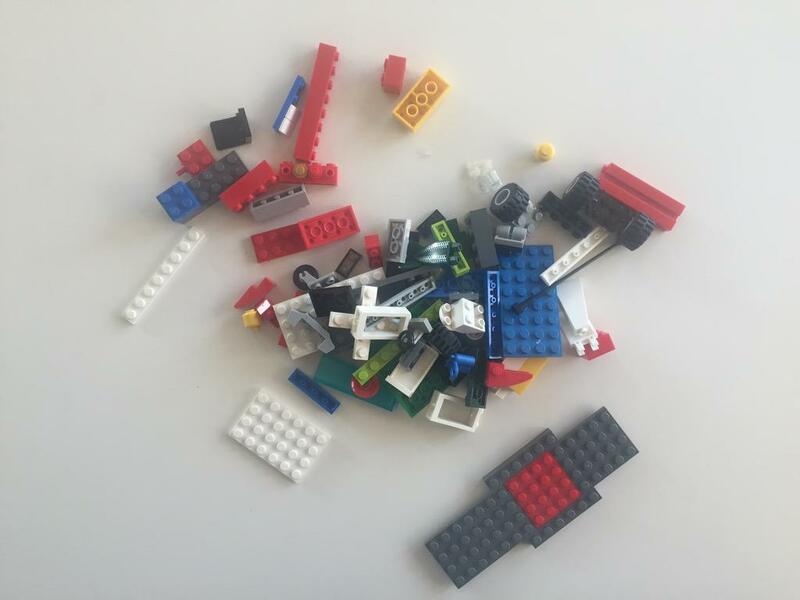 Can you recognize any components that are offered in a game? Michelle described how one child told two truths and spent so much time describing it in detail but told his lie in a very short way. Thus he was busted and Michelle said that to teach perspective (with this game and likely any game you use to teach), you must always be able to use logical reasoning to explain the answer. ie." you spent tons of time telling your two truths but you quickly told your lie, therefore the short part was a lie." The importance of this book (It's Not a Box) was discussed during the new workshop offered by Nancy Tarshis and Ryan Hendrix- Teaching Social Thinking through Stories and Play for Early Learners was very good. One thing to note: I don't think you have to know the whole Social Thinking program to attend this workshop geared towards explaining this new curriculum. I will be reviewing more product later but if you happen to go to the conference buy a poster! They are thick and strong and really really affordable. (L-R) Ryan Hendrix, Nancy Tarshis, and Tom Chapin sing "Where You Think a Thought" a song that accompanies the new curriculum "The Incredible Flexible You." The CD contains this and many other songs that written by award-winning songwriters Phil Galdston and Tom Chapin. 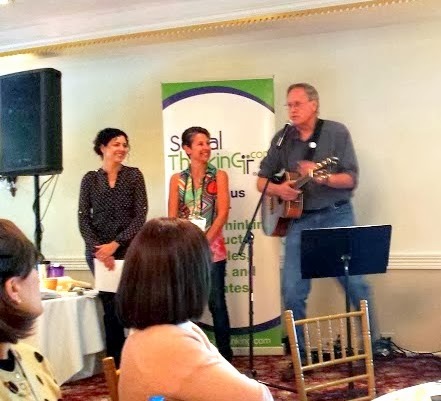 Participants of the conference had the pleasure of listening to Tom Chapin perform "Not On the Test," a song that Michelle Garcia Winner called her favorite. I don't think it's on the new curriculum CD but it's kind of not for kids to sing... or is it? I explained Social Thinking to my husband when I came home from the first day of the conference and he said, "It's so confusing." Oh, how I wish he could have come with me!!! I am nowhere near as good a speaker as she is. When Michelle Garcia Winner breaks down social interaction for you, the first thing you'll be thinking is "A-ha. That's exactly it." I think I had such A-HA moments every 10 minutes. If you have a provider who went to a Social Thinking conference, I bet you that provider is really skilled. Everyone I met was so damn cool. They loved the kids in their life. It was very obvious. Michelle Garcia Winner talks about Thinking With Your Eyes and describes a little game about how we can work on this area without too much talk. Brilliant! I also spent a good deal of time talking with conference attendees who came from places as far away as New Hampshire (5-6 hrs away). There were even folks there from Canada and Japan. And I wish you could have heard the chatter in the room. Everyone was so determined in their quest to help the children/students in their life. 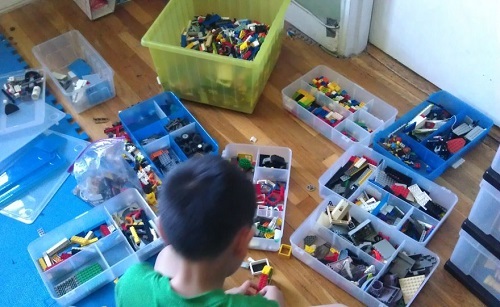 At one point, during a breakout session, I had the fortune of having my son's issue (poor supermarket manners) be problem-solved in front of me. I wish you could have heard these professionals strategize by pulling out one brilliant idea after another in seconds flat. This scene screamed out one thing to me that should have been perfectly obvious all along. People who attend conferences introducing cutting-edge treatment are amazingly competent and passionate. I can't wait to learn more about the 5-Point Scale. Looks easy to learn, doesn't it? Following Up Across the Ages- She keeps in touch with her patients. Sometimes she even employs them. Sometimes patients come back for treatment when they are older. She treats adults too and thus the range of her perspective is vast. She can view her clients directly from an employer's perspective! How many therapists do you know who can say that? I think we all really need someone who can help us see our children 15-20 years from now and knows firsthand what kind of challenges and successes they can experience as adults. It's like reading the reading comp questions before you read the passage. ** Social Thinking gets down to what's really important. Learn It, Do It, Share It- While Michelle Garcia Winner is a phenomenal speaker, I think there is so much more to Social Thinking. Whenever I am reading a Social Thinking book, I never think "Oh, I'm not a professional, this is way over my head." Which leads to me to this question: What makes a great teacher? The answer: someone who makes learning easy and fun.... so easy that the learner (you the parent and/or professional) can not only implement it but possibly even share it too. And while I think Social Thinking is in itself quite complex, the true ease of this method of learning, doing, and sharing is a critical component of its cutting edge characteristic. Children never have just one person in his/her life. Thus if Social Thinking is relatively easy to learn, implement, and share with others in the child's life, wouldn't that just mean that the child's chances to improve are just THAT MUCH BETTER? The new curriculum even has letters that go home to parents at the start of each new lesson. Still Treating Clients- It sounds as if many if not all of the partners in the Social Thinking Collaborative still treat patients on top of speaking engagements and writing curriculum. But especially in Michelle Garcia Winner's case, I can't believe how someone who speaks all over the world can manage what sounds like a significant caseload but she does. Throughout her talk, she used many examples of things that were happening with the clients in her clinic as recent as the previous week. When I asked her why she still treats clients, she looked at me as if I asked her why she still eats breakfast. In a soft but serious voice she shared,"If you stay actively inside other people's minds who need help, it just always keeps you on the cutting-edge and I always want to be on the cutting edge." There is always a long line to talk to her during breaks and at the end of a session but she makes herself available to the attendees. 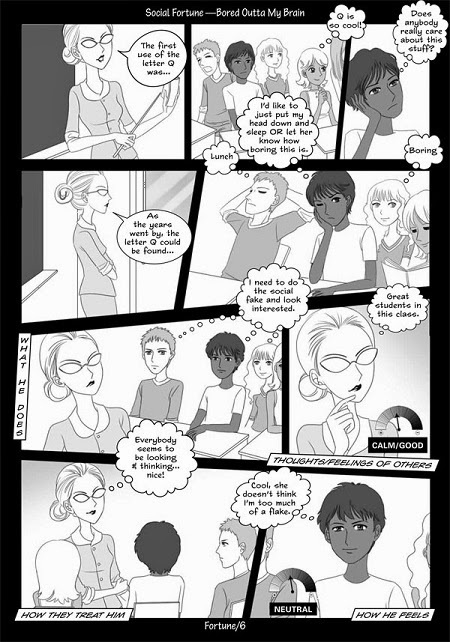 This is taken from a page from You Are a Social Detective which is fantastic! I own this too! I love the visual here. Kids need them to know that they are not "bad kids" and that they can grow their smarts in this area! 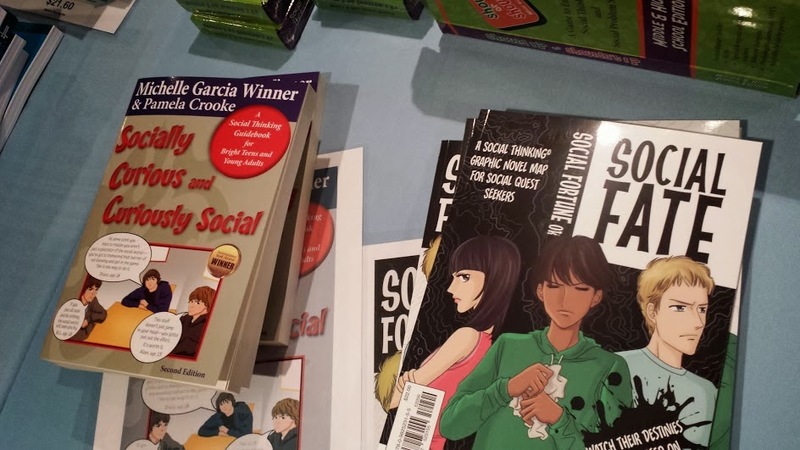 Here is a cool giveaway: One Winner will get to choose between a copy of You Are a Social Detective that is great for the elementary grades or Social Fortune or Social Fate which is great for middle/high school. And let's not forget the What is a Thought? 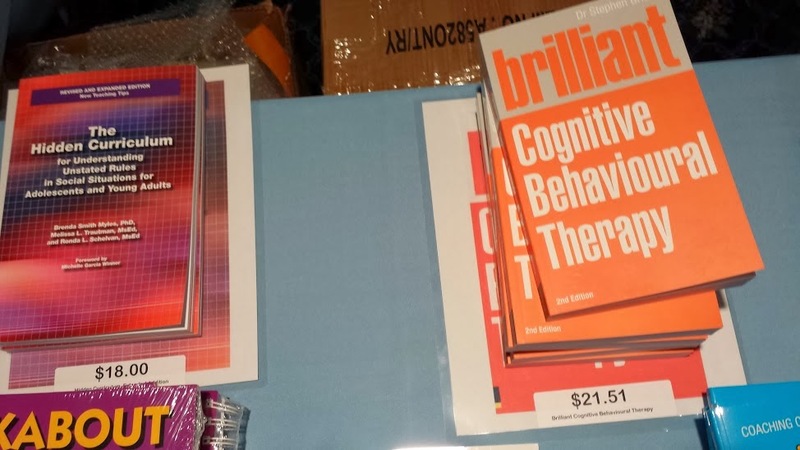 A Thought is A Lot- book which sold like super super fast at the book table at the conference. All are great books. The winner will get to choose between these three books. I love how they make this a "detective" thing. So positive. So proactive! 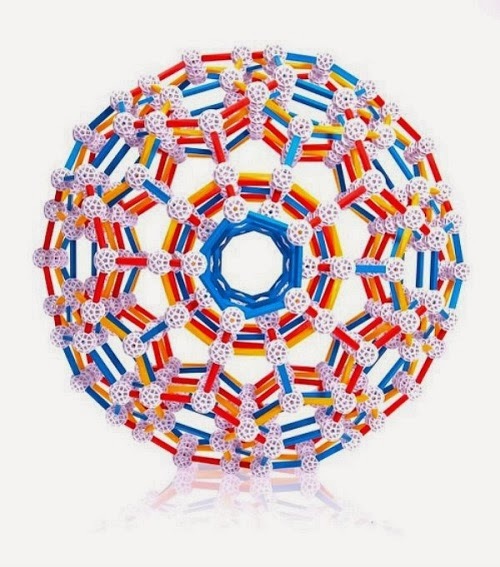 Want to buy it on Amazon? Please use my link. I sometimes find it hard to get their products on Amazon so be mindful of the retail price that I am including for your reference but please note that I am writing the going retail prices as of 10/30/13 and that they are subject to change. Social Fortune or Social Fate (I have this and love it!) retail price $22.00 Uses anime to explain things to kids. Look at pictures of it above. There is plenty of text for the teacher/therapist as well. Personal Space Camp: I bought this at the conference and it's great! * In some bathroom stalls in Asia, I've heard that there are buttons that simulate toilet flushing sounds so that people can do their thing without embarrassment. Disclosure: Toys are Tools was not compensated by the conference provider or book(s) authors for the publication of this review. Certain books shown have been purchased by yours truly and I would have probably bought them all if I could. Conference entry was provided to Toys are Tools to facilitate a review. Prizes are being donated by yours truly. Reviews are never promised. 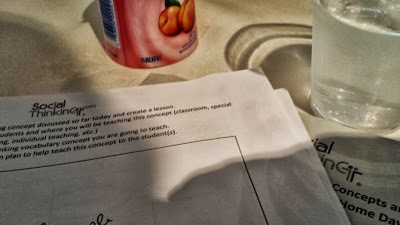 S uses 2 truths and a lie during the first class of the semester as an ice breaker with his students. We used Super Flex a lot last year. I will definitely mention this conference to our social skills group social worker. I'd say I'm "cautiously interested" in the 4 steps of social thinking. In theory I like it but I could see some of my students getting too caught up in the business of worrying about what others think of them... I suppose as part of a larger program it could make sense, but being short on time at the moment and reading just that bit in isolation, it doesn't seem so smooth to me. Chava, Thanks for your comment! It's actually not the 4 steps of social thinking. It's only the four steps of perspective taking as explained by the program. But perspective taking is the reason why lots of kids get in trouble because they aren't perspective-taking so well. Your point is interesting. I wonder if they would worry less if they learned more about the process of how and when others are thinking about them. One of the things I find so empowering about this program is that they are teaching kids that there are things that they can control when it comes to how others view them. 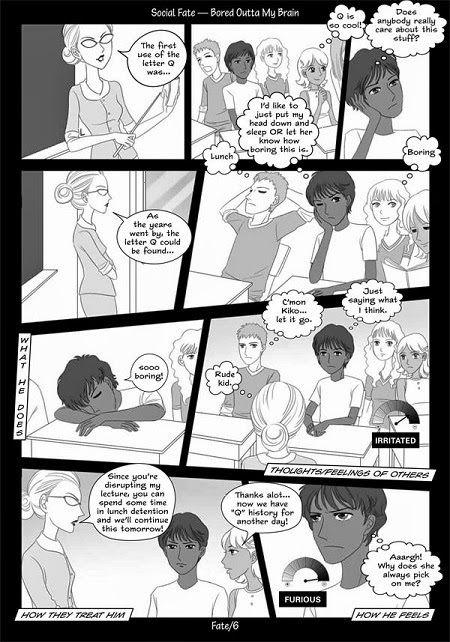 And the focus is always coming back to how the child feels after a social interaction... see the cartoon graphics above. I really love the practicality of it all. I think it appeals to the logical reasoning strengths of many of our kids. Forgive my feeble attempt to explain what I know about Social Thinking. I am still learning it but I love everything I've learned in the past 2+ years. I think step 1 & 2 of perspective taking come more naturally to everyone including kids who do not have strong social skills because those two are all about them. Steps 3 and 4, but especially 3, are incredibly hard for them because they have to think of others and not only think of other but try to understand what they think. I think those are important but the struggle is how to get kids with ADHD, Aspergers, etc. to be able to do steps 3 and 4 automatically and independently. I am curious how the Incredible Flexible You differs from other programs or sets of books which also address similar topics. The books look similar to ones that I have purchased in the past and my son read those once and hasn't shown any interest. I think he gets they are to "teach" him and not about being fun. Should I or Shouldn't I looks like an interesting game. Are they coming out with a set for younger kids? I could see my son playing this in his social skills group. 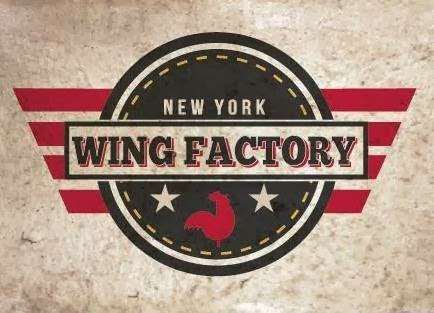 I missed the NY conference and would attend it if the conference could be held in NYC sometime soon :)! I'm sure several practitioners and families in NYC would benefit from this conference. Also - it seems like the game would be something really fun for doing at dinner time. We've played category games during dinner in the past and this has worked really well for our son. The more we participate in the learning process, the more he is interested in learning and participating as well. Regarding the 4 steps of perspective taking: is this something that is shared with children? I'm guessing there may be more explanation in some of the readings I have yet to look at. My son loves lists and I could see him benefiting from understanding the process of perspective, but would love a kid-friendly breakdown or to understand a way to translate this to him. Or is that not the point? Maybe adults are just supposed to understand the steps in order to understand how to apply the methods better? 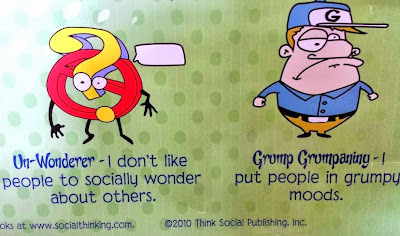 In Social Thinking there are lessons/discussions about "Social Radar" as relates to the size of the thoughts we have about others and they have about us. For my clients that think everyone is having a huge thought about them we talk about how we all have social radar which is really an awareness of those around us. If we are all doing what's expected then no one is really having big thoughts about us. It's super important to teach them that they control the size of the thought others have about them! Great review and commentary of the conference! 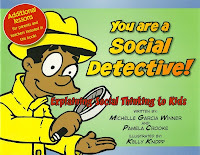 I'm lucky enough to live in San Diego and have trained extensively with Michelle....Social Thinking truly is amazing!